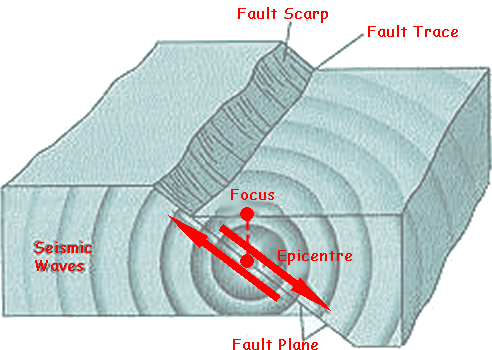 Surface waves are the earthquake waves that travel through the Earth's crust. If large enough, they may actually cause ripples on the surface. It is the surface waves that are most damaging as they cause the earth's crust to undulate and make buildings collapse. These travel more slowly than P-waves or S-waves. As these travel through the 'crust of the Earth' (lithosphere). I had thought that they got their name from that! But they actually get their name from the scientist/mathematician who discovered them! - A.E.H. Love. The L waves travel along the surface of the earth from the point directly above the quake or epicenter. Love (L) waves are shear waves where the shearing (back and forth) motion, is confined to a horizontal plane at the Earth's surface. Rayleigh (R) waves are very similar to water waves - a piece of the Earth's surface moves in a vertical, elliptical path parallel to the direction of wave movement when an R-wave passes through the crust..